Lester Horton (January 23, 1906 – November 2, 1953) was born and raised in Indianapolis, Indiana. As a young boy, Horton was fascinated by the American Indian, which later inspired him to study Native American dance and influenced his movement style. His interest in dance began in 1922 when Ted Shawn and Ruth St. Denis’s tour came to Indianapolis. He began to study ballet, and in 1925 he auditioned for a US tour with Forrest Thornburg, a former Denishawn dancer. Touring allowed him to learn a large part of the Denishawn repertoire and study modern. After the tour he returned to Indianapolis where he pursued his early interest in the American Indian and studied Native American dance with Clara Bates. Together they created a pageant based on the poem “The Song of Hiawatha”. They were invited to perform the piece at the Argus Bowl in Eagle Rock, Ca in 1929. Horton decided to stay in California where he began to study with Michio Ito. Later that year he performed At The Hawk’s Well choreographed by Ito at the Argus Bowl. Horton began teaching and choreographing in the Los Angeles Area. In 1931 he began teaching students at Glendale High School, and in 1932 he joined the faculty at Norma Gould’s School of Dance. He was invited to perform at the Dance Festival at the 1931 Los Angeles Olympic Games, and in 1932 he formed his first company, the Lester Horton Dancers. Over its lifetime from 1932-1944, the company had several names including: Lester Horton California Ballet (1934) and The Horton Dance Group (1934). Together with Gould he produced a concert in 1935 called Sun Cycle that featured Hopi Indians. He produced his first evening length concert at the Shrine Auditorium in 1934, and in 1937 he was invited to choreograph a ballet, his own Sacre du Printemps, for the Hollywood Bowl. In addition to choreographing for his company, Horton choreographed for 19 films and musicals. His work can be seen in Moonlight in Havana (1942) and Arthur Lubin’s Phantom of the Opera (1943). 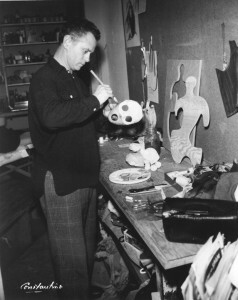 In addition to choreography, Horton was also proficient in costume and set design, and he often created his own designs for his company’s choreographies. After a short break, Horton purchased a space in West Hollywood and in partnership with Bella Lewitzky founded Dance Theatre in 1946. The only space in Los Angeles dedicated to modern dance, Dance Theatre included a school that hosted a children’s training programs and company rehearsals and a theater space next door for performances. In 1950 the partnership with Lewitzky was dissolved, but Horton continued to maintain Dance Theater until he passed away from a heart attack in 1953. After his death his partner Frank Eng operated Dance Theatre until 1960. In 1996 the Lester Horton Dance Theater Collection was acquired by the Library of Congress. Horton left a significant legacy of modern dance in Los Angeles and the world. His unique training technique (Horton Technique) combined elements of Native American Folk Dance, Afro-Caribbean hip circles, Javanese and Balinese isolations of the upper body, Japanese arm gestures, and a new whole body, anatomical approach to movement. After his death, his students continued to teach his technique and incorporate it into their companies’ repertoire. Unlike his peers, Horton was based on the west coast and believed in modern dance in Los Angeles. He developed a large repertoire of choreography including Salome, Le Sacre du Printemps (1937), To José Clemente Orozco, The Beloved, Conquest, Art Patrons, and Flight from Reality. His work often included social and political protest and satire and helped develop the Dance Theater style in the United States. Lastly, Horton’s dancers were a mix of races and ethnicities, a bold move ahead of its time. Horton’s students carry on his legacy through their individual companies’ repertoire and training schools. Among the best known are Alvin Ailey, Joyce Trisler, and Bella Lewitsky. Other notable students include: Carmen de Lavallade, James Truitte, Janet Collins, James Mitchell, Rudi Gernreich, and Eleanor Brooks. In honor of Horton’s legacy, each year the Dance Resource Center of Los Angeles awards Horton Dance Awards to outstanding individuals in the dance field in the Los Angeles area. If you represent Lester Horton or have material relevant to the artist, we invite you to contribute.